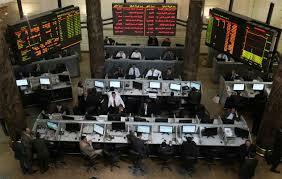 The Egyptian Stock Exchange’s indices went down during last week’s trading as the benchmark (EGX30) dropped by 2.89 percent to settle at 5,268 points, the same occurred to small and medium shares index (EGX70), which went down by 1.19 percent, registering at 441 points. The stock market weekly report showed that (EGX100) index decreased by 1.44 percent to settle at 747 points, while the (EGX20) also went down by 3.05 percent to stand at 6,122 points. The report data also showed that the capital market listed companies’ shares dropped by 5.6 billion pounds, registering 354.7 billion pounds. The value of traded recorded one billion pounds worth a total of 464 million shares, traded in 92,000 deals, compared to the value of shares of 1.8 billion pounds worth a total of 434 million traded in 80,000 deals in the previous week.